We’d love your help. 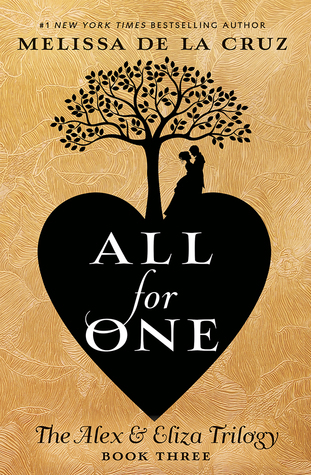 Let us know what’s wrong with this preview of All For One by Melissa de la Cruz. Is this the final book in the series or will there be more? Heather McC This is the final book in the trilogy. I did enjoy this instalment more than its predecessors- but some significant artistic licence was taken with the historical accuracy. I can understand this, of course, as this series is a fictional take on the lives of the figures: but some jumbled events on the timeline are quite noticeable if you are interested in the history behind the book's cast of characters. This cover is GORGEOUS! I knew this one was going to have gold and black. I knew it! So good. 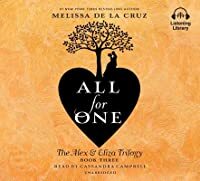 Such a great conclusion to the Alex & Eliza trilogy! I love the author's notes at the end and the explanations for how and why and where liberty was taken with historical events/information. Historical fiction is quite the favorite genre of mine, and this is a great YA historical fiction trilogy. A 3.5 rating, really. The author captures myriad historical details in the engaging and fluent telling of a brief period of time in the lives of Alexander and Eliza Hamilton, but takes significant artistic license with the timeline of actual events. Complete review to follow in VOYA.